Methyl isobutyl ketone (MIBK) and methyl isobutyl carbinol (MIBC) are flammable, colorless, stable liquids that are largely consumed in solvent applications. MIBK is an excellent solvent for resins used in the production of surface coatings, as well as being widely used in rubber chemicals for the production of tires, as a solvent in the manufacture of pharmaceuticals and adhesives, and for specialized metallurgical extraction. Solvent applications account for nearly half of total MIBK consumption. MIBC’s major application is in the manufacture of lube oil additives, followed by its use as the principal flotation frother in treating copper and other ores. Surface coatings make up a minor portion of MIBC consumption. Over half of global MIBK is consumed in Asia, with China accounting for half of the regional consumption. Solvent applications (mostly in surface coatings) consumed the majority of MIBK in most regions (about half of total consumption in 2017). Consumption in the developed regions is expected to stay relatively flat or even slightly decrease, because of increasing environmental concerns about volatile organic compounds (VOCs), as well as the trend toward more waterborne solvent systems. In the developing countries like China, MIBK use in coatings will continue to increase at more than 3% per year in 2017–22 because of MIBK’s high solvent power. Consumption of MIBK in rubber antiozonants accounted for about one-third of the global total in 2017, and has grown strongly in recent years, driven by increased tire production in Asia, particularly in China. About half of world MIBK consumption in the rubber antiozonants market is concentrated in China, where radial tire demand has increased as a result of the rapid development of China’s automobile industry. There may be some reformulation in certain MIBK applications as a result of environmental regulations, but cost pressures may limit reformulation activity. MIBK was subject to further restrictions on 28 March 2014, when the Office of Environmental Health Hazard Assessment (OEHHA) added it to the Proposition 65 list of chemicals known to the state of California to cause reproductive toxicity. As May 2018, the listing of MIBK in Proposition 65 had not yet had a major impact on its consumption. 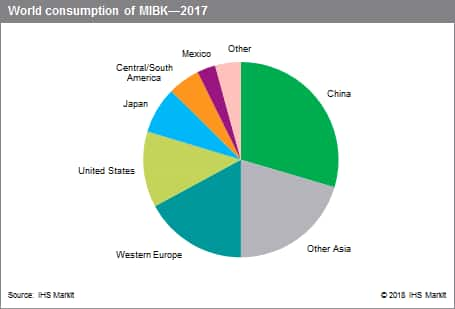 Overall, total world MIBK consumption will grow at less than 2% per year from 2017 to 2022, driven by demand in Asia, especially in China. MIBC’s major application is in the manufacture of lube oil additives, followed by its use as the principal flotation frother in treating copper and other ores. Surface coatings make up a minor portion of MIBC consumption. World MIBC statistics are difficult to estimate, but overall, MIBC will experience positive growth in lube oil applications and as a flotation frother (especially in actively mined regions). MIBK and MIBC prices are significantly affected by feedstock costs (acetone and its raw material propylene) and the price of natural gas (the production of MIBK/MIBC is very energy intensive). In most regions, the lower raw material prices and weak demand led to lower MIBK/MIBC prices in 2015–17, compared with those in 2010–14. The largest producers of MIBK are LCY Chemical (with plants in Taiwan and China), Kumho P&B Chemicals in South Korea, and Sasol in South Africa. These companies each accounted for about 12–13% of global capacity in 2017, and developed their MIBK production largely for the export market. LCY invested in capacity in China in 2009 to supply the domestic Chinese market, leading to lower exports from its Taiwanese unit to China. China is the only producing country expected to increase capacity during the forecast period.